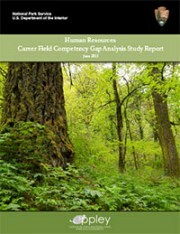 The goal of the National Park Service Human Resources Career Field Competency Gap Analysis is to determine any gaps in general competencies and human resource technical competencies for employees who work in the NPS Human Resources career field. This study consisted of five stages: determination of the research methodology; development of the survey instrument; collection of data; analysis of data; and reporting of findings. This report documents the findings.